Working for a California headquartered company has it’s pluses and minuses – an eleven hour flight each way, every few months, is no fun but San Francisco is a great city to visit and with the Dollar at two to the Pound, any visit to the USA is a Tackle Tart’s dream, with most of the well known American brands on sale at Dollar for Pound prices. On top of that, since joining MarkMonitor, almost exactly a year ago, I had found a good number of anglers in the company, most notably Marcus Schroers who works in the US sales team and is a “heavyweight” angler in every sense of the word. Irrespective of the weather, Marcus goes out in his high speed boat pretty much every weekend either into the ocean or the river delta. Most importantly, Marcus loves to fly fish and kept regaling me with stories of various bass species, liberally sprinkled with some tempting photos of himself and friends showing off some pretty hefty fish, or 'cows' as the big bass are known in the US. So……………….wind the clock back to July, and I had my first trip with Marcus, albeit not fly fishing and not chasing bass, but trolling for salmon in the Pacific. This started with a spectacular 30mph hour ride through the stunning Golden Gate Bridge at the crack of dawn, but sadly some beautiful home smoked was as close to the species as we got – seven hours of hard slog saw us without a pull and on the receiving end of plenty of gyp from our workmates the following day in the office. 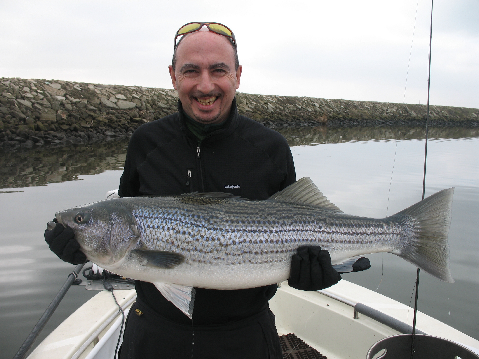 Throughout all of November and December I received emails with tales of a dozen plus Striped Bass per outing with the warning “it goes off when the cold weather comes” which was to prepare me for my January visit. In the fortnight before I flew out, the weather deteriorated and Marcus blanked twice. Just the news I wanted! I could feel another disappointment on the way, but I still had something to look forward to - a new rod that I had pre-ordered and had sent to my hotel. When I flew into San Francisco, the bumpy landing told me all I needed to know about the weather - blowing a gale, and pouring like it had right through the winter in England. On the bright side, we still had five days before our trip and the forecast was for an improvement in the weather, so maybe the Gods were starting to smile. Preparing for the big day, I had agreed to take care of refreshments and so had gone to great lengths to find the closest thing to traditional English fishing fare I could – meat pies! Incredibly, these are a big rarity in California but I tracked some down at Kearny Pies, unsurprisingly owned by a gent from Brighton. Loaded up with a selection of beef, chicken and potato pies, as well as a couple of packs of beef jerky, my car hire felt ready for action. One thing I forgot to mention as a downside to fishing with Marcus is that he likes to be “first on the water” which means meeting some distance from town well before dawn and I have learnt the hard way that a single way cab fare at that time well exceeds the price of a car for the weekend, so I was better organised this time and had set up a rental. If you hire a car in the US read the details on where you can and can't take it. Some hire car companies won't allow you to take the car on to beaches etc. Leaving at 4.30am is something of a hardship, even though I struggle to sleep with an eight hour time difference, but I was promptly on my way with my new rod and a selection of DI7 and DI3 shooting heads on an old Danica reel which has virtually no drag, as well as all the grub. Fifty miles of driving on the wrong side of the road at night focuses your mind and, by the time we met up and launched the boat, still in the dark, I was convinced that we were insane. It was pitch black, I was on a tiny boat with a 115HP engine on the back, and roaring through some narrow parts of the San Joaquim River Delta near Sacramento. This impression was rapidly confirmed when my hat blew off and we were searching the thankfully flat calm surface for a black baseball cap – incredibly Marcus located it, albeit soaked through. As dawn broke we could see that it was going to be a mild and very importantly, windless, day which makes holding the boat in position so much easier – the “Delta” is a kind of estuarial river, with many channels from 40-80 yards wide, slow flowing with mainly piled or rush banks. We started in a spot Marcus knew well and the method we used was to run the boat very slowly, using an auxiliary electric motor, down the centre of the river delta, leaving a cast of around 25-35 yards to either bank. Marcus set up with a 10 weight rod, T14 shooting head and a large green and white lure, casting it tight to the bank and using slow strips back to the boat with a short hang. The motor is cleverly set up to be remote controlled from a foot pedal and Marcus skillfully navigated us up a likely looking piece of piled bank. My new 7 weight Orvis was loaded with a DI3 shooting head and 17lb line but felt rather “under-gunned” and after a while I came to the conclusion it was not getting down fast enough in the 10-15ft of water we had in most of the delta. The water here was more coloured than we would have liked although Marcus was confident we would catch “one or two at least” because of the relative mildness and calm for the time of year. An hour in and no pulls, so we pulled in the electric, gunned the outboard and rocketed through the twisting, turning lanes of the Delta to another favourite spot. 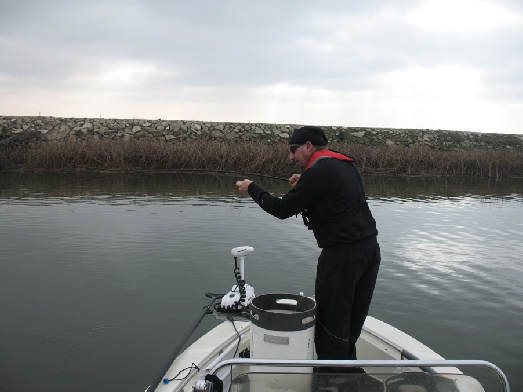 After ten minutes or so here, Marcus thought he had a pluck and, a couple of casts later he was into a fish. I was pretty shocked at the sheer violence of the encounter as he yanked a very angry Striper towards the boat and lifted it out with his hand in its jaw. It was a beautiful fish of 10-12lbs and I was delighted to have at last seen such a fish. By now I had changed to my Di7 rig and a white lure with a red fritz head, which Marcus had tied the night before, about five inches long on a 1/0, and I was amazed to even be able to turn it over with a 7 weight but it was working OK and only a few casts later I was into one, albeit a tiny fish of 2-3lbs which was hooked in the top of the head. Still, no blank and my first Striped Bass, a great feeling and we were both delighted to be off the mark. We spent the next hour or so chugging up and down this area trying various methods. I even tried a very short leader and slow retrieve with floating lure, like a giant booby rig and eventually Marcus had another fish slightly smaller than his first and again dealt with in a couple of minutes (all fish were returned carefully, by the way). Just as we were thinking of another move, I had a tug close to the boat and the fish shot towards me and under the boat. At this point, it did not feel very big and the only hazard I could see was that my shooting line was caught under one leg, but nothing a bit of hopping wouldn’t solve. That is, until the fish really woke up and decided to head down the channel, when my light rod and dragless reel started to feel way off the mark. This really was a steaming set of runs, but I still thought it was just a similar fish to Marcus’ and my gear and lack of experience was preventing me muscling it back. A few minutes later with me muttering “it isn’t a race” to myself and I was dying to at least see the sunken force now circling below the boat. When it was eventually a couple of feet down we could see it was a bigger fish but it still did not seem anything special, but as it came right on top and Marcus hauled it in the boat, he was sure it was over 25lbs and the Boga Grip confirmed it was just a “thirty”, apparently quite a landmark in the Striper fishing scene out there. 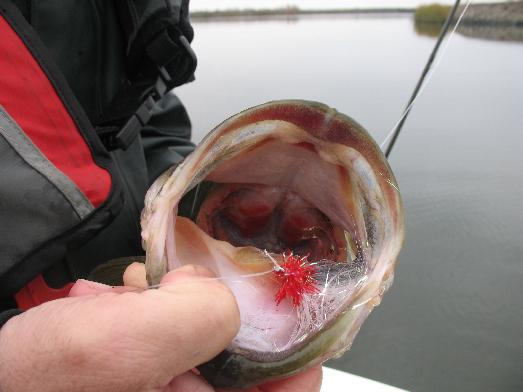 Its head was so big I was able to put my whole hand in to get the seemingly tiny fly (on a 1/0) out – what a spectacular fish, bristling with the savagery of a true predator. Lots of pictures and some nursing later, it swam off strongly. Marcus could not stop chuckling about the fact I had lucked onto the biggest of the species his boat had seen on my very first trip – not only that, I had the audacity to get it out on trout gear. To be fair, he was dead chuffed and told any passing boats and, especially guides out with fishless clients, what we had done. We carried on for a couple of hours and not even repeated texts from my colleagues in a sports bar watching Man Utd thrash my beloved Toon Army 6-0 could puncture the mood. I did catch a decent Largemouth, in the 3-4lbs range and we had a couple more pulls but, at 2pm we headed for the jetty and the longish drive back to the city. By the time I passed Marcus and his boat on the highway, I could see him on the phone to his Bass fishing chums, passing on the news of a trophy fish snagged by a complete beginner………………………..looking forward to his next excuse to get over there when the water has warmed up !